October 10, 2016 – This week, our time machine returns to the days of the Revolutionary War, and views it through the eyes of Isabel and Curzon, two of the African-American children held in slavery. 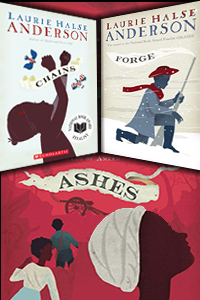 Laurie Halse Anderson’s trilogy, The Seeds of America , includes the books Chains, Forge, and the just-released blistering conclusion, Ashes. Laura Halse Anderson is a New York Times-bestselling author who has earned numerous American Library Association and state awards. Not only did she talk about her own writing, but she shared her passion for inspiring young people to love history, and gave advice on how they can get their work published. Chains was a National Book Award finalists, and also made the Carnegie Medal Shortlist in the U.K. You can enjoy her blogging at MadWomanInTheForest.com, and link up with her on Twitter, Facebook, etc. If you enjoy The Seeds of America Trilogy, you may check out our previous interview with Chris Stevenson on his book, The Drum of Destiny, which views the revolution through an orphaned indentured servant, who dreams of joining the Patriot Army.